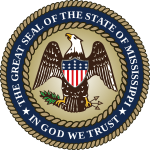 The 1992 United States presidential election in Mississippi took place on November 3, 1992, as part of the 1992 United States presidential election. Voters chose seven representatives, or electors to the Electoral College, who voted for president and vice president. Mississippi was won by incumbent President George H.W. Bush (R-Texas) with 49.68 percent of the popular vote over Governor Bill Clinton (D-Arkansas) with 40.77 percent. Businessman Ross Perot (I-Texas) finished in third, with 8.72 percent of the popular vote. Clinton ultimately won the national vote, defeating both incumbent President Bush and Perot. Mississippi was President Bush’s strongest state in the 1992 election. It was also Ross Perot’s weakest state, and the only one where he failed to win more than 10% of the vote. He only did worse in the District of Columbia. As of the 2016 presidential election[update], this is the last election in which Hinds County voted for a Republican presidential candidate and the last election in which Tishomingo County voted for a Democratic presidential candidate. This is the only state in the 1992 election in which the combined vote totals of Ross Perot and Bill Clinton would be insufficient to defeat Bush. ^ a b c "1992 Presidential General Election Results – Mississippi". Dave Leip’s U.S. Election Atlas. Retrieved 8 June 2012.